ณ วันที่ 16 พฤศจิกายน 2018. ↑ "Mohamed Salah". Soccerway. สืบค้นเมื่อ 17 May 2014. ↑ ‘รัสเซีย’ ต้อน ‘อียิปต์’ จ่อเข้ารอบทีมแรกฟุตบอลโลก2018 เรียกข้อมูลเมื่อ 10-10-2018 จาก ข่าวสด วันที่ 20 มิถุนายน 2561 - 03:00 น. ↑ "Mohamed Salah". Soccerway. สืบค้นเมื่อ 23 September 2015. ↑ Kingsley Kobo (8 October 2011). "Egypt 3–0 Niger: The Pharaohs thrash the Mena, who qualify nonetheless". Goal.com. สืบค้นเมื่อ 27 July 2016. ↑ Ahmed Abd El Rasoul (27 February 2012). "'Mourning' Pharaohs hammer Kenya in Doha friendly". Al-Ahram. สืบค้นเมื่อ 27 July 2016. ↑ "Egypt/Uganda: Nation beats Uganda 2–1 in friendly in Sudan". AllAfrica.com. 30 March 2012. สืบค้นเมื่อ 27 July 2016. ↑ Mahmoud Elassal (1 April 2012). "Egypt crush Chad 4–0 in friendly game". Al-Ahram. สืบค้นเมื่อ 27 July 2016. ↑ "Egypt 3–0 Togo: Mohamed Salah nets brace in Pharaohs win". Goal.com. 23 May 2012. สืบค้นเมื่อ 27 July 2016. ↑ "Guinea 2–3 Egypt: Aboutrika brace and Salah's last-gasp winner power Pharaohs in Conakry". Goal.com. 10 June 2012. สืบค้นเมื่อ 27 July 2016. ↑ "Egypt 2–3 Central African Republic: Momi double stuns Pharaohs in Alexandria". Goal.com. 15 June 2012. สืบค้นเมื่อ 27 July 2016. ↑ Habib El Magrissy (6 February 2013). "Egypt fall to Chile in Madrid". KingFut. สืบค้นเมื่อ 27 July 2016. ↑ "Egypt thrash Zimbabwe 4–2 to secure 12-point lead". starafrica.com. 9 June 2013. สืบค้นเมื่อ 27 July 2016. ↑ "Egypt qualify for the final World Cup qualifying play-offs after beating Mozambique 1–0". EPFA Egypt.com. 16 June 2013. สืบค้นเมื่อ 27 July 2016. ↑ "Egypt beat Uganda 3–0 as friendly goes ahead despite political upheaval". Al-Ahram. 14 August 2013. สืบค้นเมื่อ 27 July 2016. ↑ Hatem Maher (10 September 2013). "Egypt maintain perfect World Cup qualifying run with 4–2 win". Al-Ahram. สืบค้นเมื่อ 27 July 2016. ↑ Hatem Maher (5 March 2014). "Egypt give Gharib winning start with 2–0 victory over Bosnia". Al-Ahram. สืบค้นเมื่อ 27 July 2016. ↑ "Egypt fall 3-2 in Santiago to World Cup-bound Chile". KingFut. 31 May 2014. สืบค้นเมื่อ 18 February 2019. ↑ Hatem Maher (10 October 2014). "Egypt revive Nations Cup hopes with 2–0 win in Botswana". Al-Ahram. สืบค้นเมื่อ 27 July 2016. ↑ "Egypt seal double over Botswana in 2015 AFCON qualifying". KingFut. 15 October 2014. สืบค้นเมื่อ 27 July 2016. ↑ "RELIVE: Tunisia v Egypt (2015 AFCON qualifiers)". Al-Ahram. 19 November 2014. สืบค้นเมื่อ 27 July 2016. ↑ "Salah leads Egypt to 3–0 thrashing of Tanzania". africanfootball.com. 14 June 2015. สืบค้นเมื่อ 27 July 2016. ↑ Omar Zaazou (6 September 2015). "Morsi hat-trick helps Egypt thump Chad 5–1 away from home". Al-Ahram. สืบค้นเมื่อ 27 July 2016. ↑ "Afcon 2017: Salah scores late leveller for Egypt against Nigeria". BBC Sport. 25 March 2016. สืบค้นเมื่อ 27 July 2016. ↑ Khaled Ali (4 June 2016). "Salah brace against Tanzania seals AFCON comeback". KingFut. สืบค้นเมื่อ 27 July 2016. ↑ "Egypt earn comeback win at Congo to lead World Cup qualifying group". Al-Ahram. 9 October 2016. สืบค้นเมื่อ 9 October 2016. ↑ "Egypt 2 Ghana 0: Salah, Said put Black Stars in trouble". Yahoo Sports. 13 November 2016. สืบค้นเมื่อ 13 November 2016. ↑ "Egypt v Ghana: AFCON 2017 – as it happened". The Guardian. 25 January 2017. สืบค้นเมื่อ 25 January 2017. ↑ "Burkina Faso 1–1 Egypt (3–4 pens): AFCON 2017 semi-final – as it happened". The Guardian. 1 February 2017. สืบค้นเมื่อ 1 February 2017. ↑ "2018 World Cup: Egypt leapfrog Uganda at top of Group E". BBC Sport. 5 September 2017. สืบค้นเมื่อ 5 September 2017. 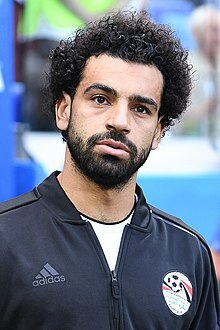 ↑ "Liverpool star Mo Salah sends Egypt to Russia 2018 with winner in fifth minute of added time against Congo". Daily Mirror. 8 October 2017. สืบค้นเมื่อ 8 October 2017. ↑ "Salah goal spoiled by Ronaldo double as Portugal earn 2–1 win over brave Egypt". Al-Ahram. 5 September 2017. สืบค้นเมื่อ 23 March 2018. ↑ Amy Lawrence (19 June 2018). "Russia all but qualify for knockout stage with win over Mo Salah's Egypt". The Guardian. สืบค้นเมื่อ 18 February 2019. ↑ Mahmoud Khaled (25 June 2018). "Egypt finish bottom of World Cup group after last-gasp defeat to Saudi Arabia". KingFut. สืบค้นเมื่อ 18 February 2019. ↑ Luke McBride (8 September 2018). "Aguirre's first game ends in Egypt beating Niger 6-0 in AFCON qualifier". KingFut. สืบค้นเมื่อ 18 February 2019. ↑ Mahmoud Khaled (12 October 2018). "Handy victory for Egypt against Eswatini in AFCON qualifiers". KingFut. สืบค้นเมื่อ 18 February 2019. ↑ Ali Ismail (16 November 2018). "Egypt beat Tunisia in thrilling form in AFCON qualifiers". KingFut. สืบค้นเมื่อ 18 February 2019. หน้านี้แก้ไขล่าสุดเมื่อวันที่ 22 เมษายน 2562 เวลา 17:00 น.